Tally Ho! 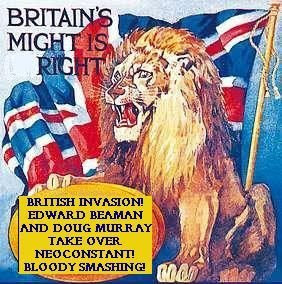 A British Invasion took over Neoconstant when hot Brit cat Beaman unleashed a very great interview with fellow Brit babe Douglas Murray - the author of "Neoconservatism and why we still need it"
This is significant. Communication Breakdowns can be avoided if PR is waged like an ad campaign. He also appears in the British and foreign press, and has written for The Sunday Times, The Guardian, The New York Sun, NRC Handelsbad and numerous other magazines and newspapers. Murray also lectures and debates widely across Europe and America. In the last year he has spoken at, among other venues, the Manhattan Institute (New York), The Battle of Ideas (London), the Burke Institute, (Vanenburg), The Pim Fortuyn Memorial Conference (The Hague), the Hudson Institute (Washington), the Freedom Center (LA) and the White House. In January 2007 he debated the Mayor of London at the 'Clash of Civilisations' debate in London. Congrats to Beaman for an exceptional coup and thanks to Neoconstant for sharing. Hi BeAmAn! Oh yes - I created that JUST for you! At the last moment and at great expence too. Just Teasing! "What matters is that the case for democracy and universal rights as well as the refutation of the lies and misunderstandings of our enemies – at home and broad – continues"
Aries! Hey there - thank you very much. Success! to you also. Super fast connectivity seems essential in the new millennium - it should help anyone here pretty soon as free markets and info tech spread.